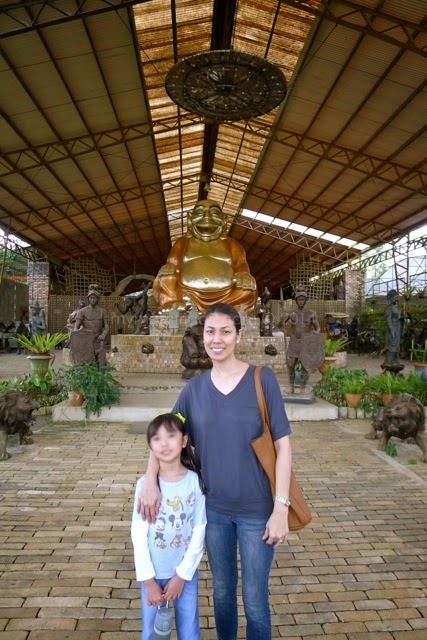 We have not been back to Tagaytay since last summer, and whenever we get the chance to visit the cool city for the south, we grab it. 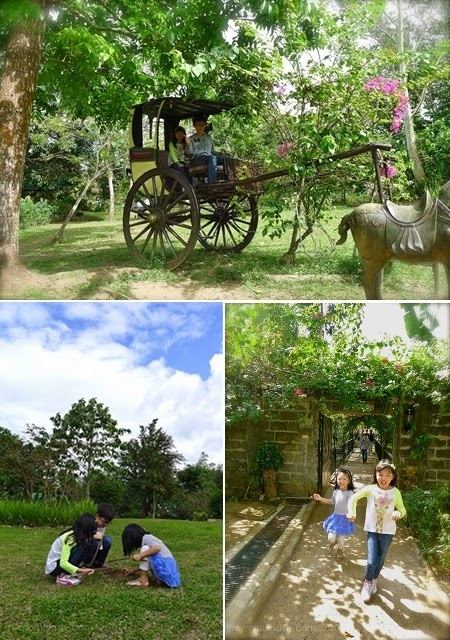 Two weeks ago, we excitedly welcomed an invitation to stay at Wilson's Place with a tour of Yoki's Farm and Balay Indang for a complete recreational experience for the whole family. 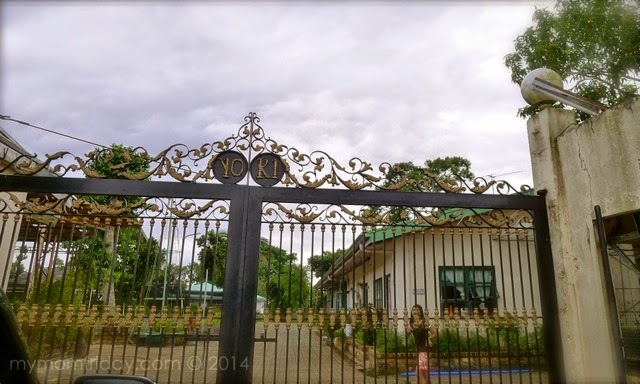 To be more accurate, Yoki's and Balay Indang is located in Cavite, just off Tagaytay's boundary and about half an hour's drive from Tagaytay's main roundabout. Still, the weather is sunny and oh so cool! Our accommodations for the weekend was at Wilson's Place Bed and Breakfast, which I will share in another feature. 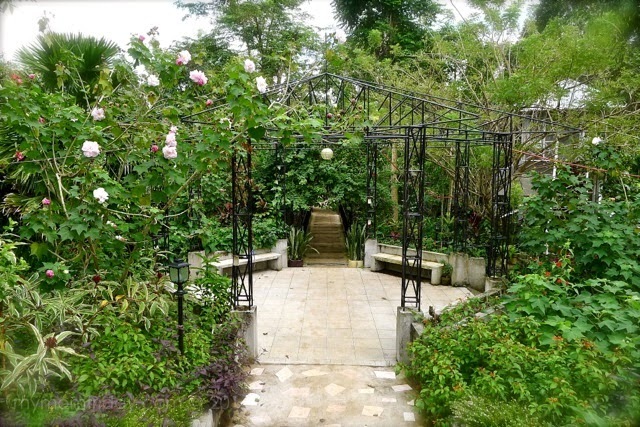 All three properties are owned and operated by the same family, who warmly welcomed us to their gardens and resorts, each with it's own unique charm. There are too many attractions to share and these are just the highlights of our tour. 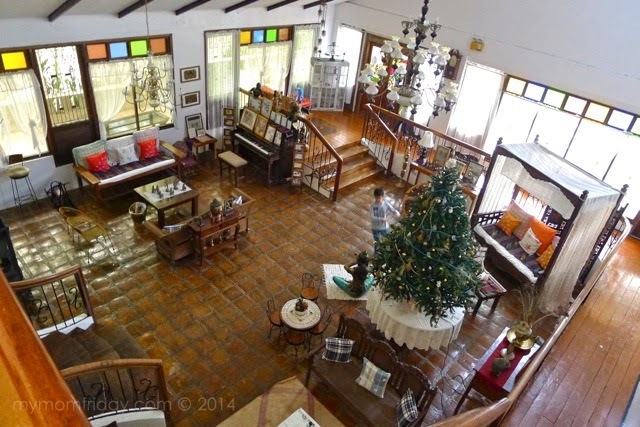 Scroll down and see what's in store for you when you visit Yoki's and Balay Indang. 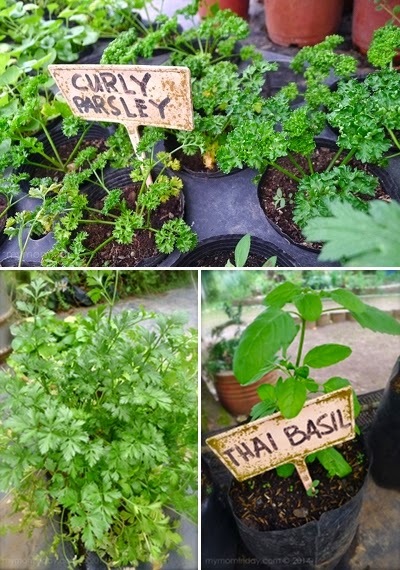 Features a hydroponic farm of a variety of lettuce, fruit bearing trees, orchid and herb garden, mini zoo, and a vast gallery of private collections of antiques and artifacts from around the world. 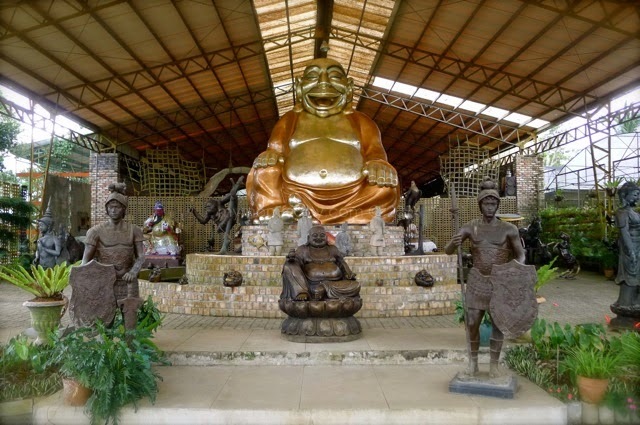 The centerpiece of Yoki -- a huge laughing buddha sits on a pedestal, surrounded by smaller buddhas. 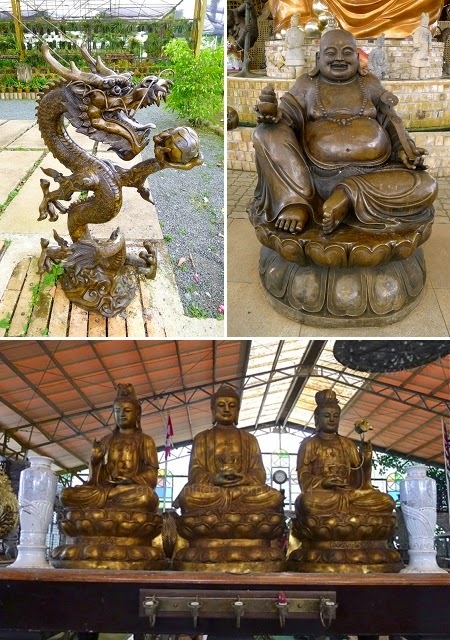 Chinese dragon, one of the bigger buddhas, and large statues of Quan Yin Ma (goddess of mercy). 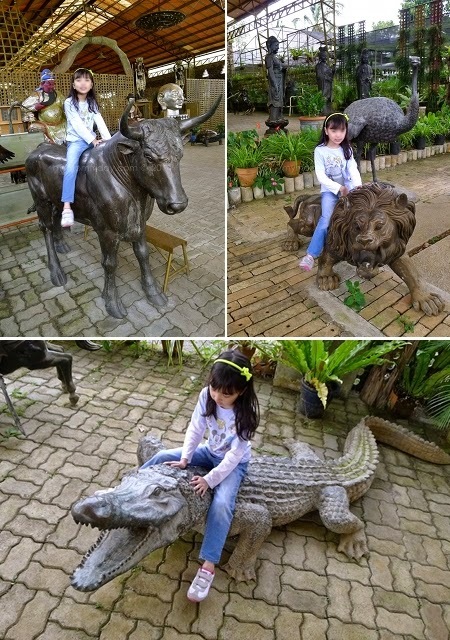 This girl can't help herself -- she was so amused and has to ride on each animal that she can sit on! 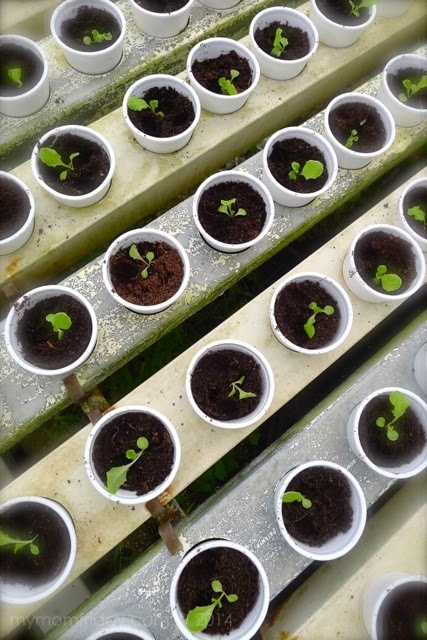 These are just three out of many. 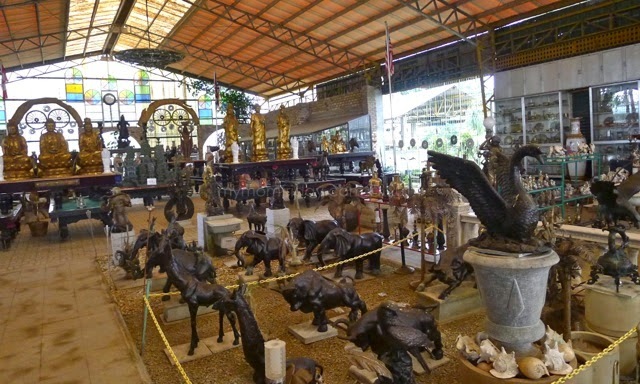 More animal statues and ornaments spread all around the warehouse. Smaller items are in glass display cabinets. 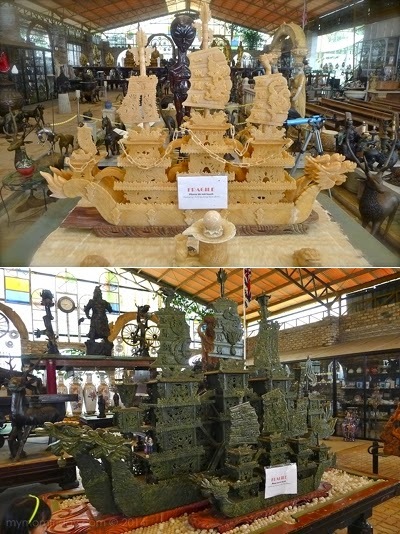 Chinese galleon from intricately carved marble (or jade) stone, about 3 to 4 feet wide. 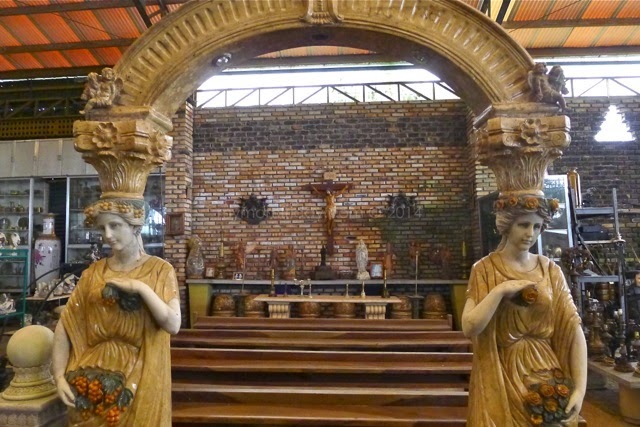 This was set up like a mini chapel complete with a crucifix, "altar", and pews. Walk like an Egyptian when you pass through these doors. 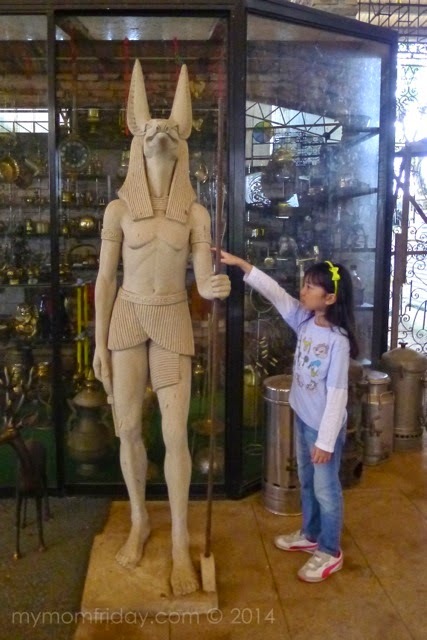 =) Is that Anubis? 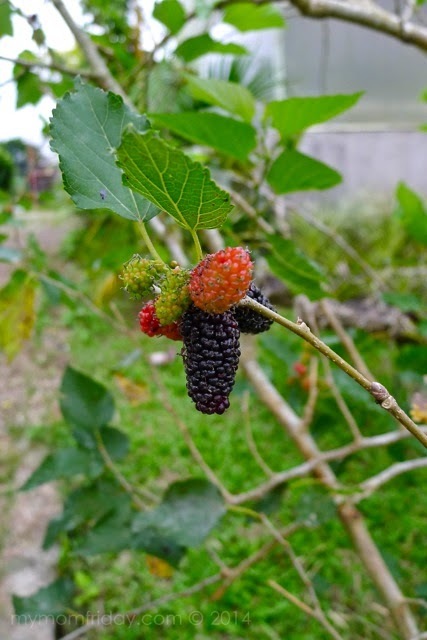 Spotted some flowers and mulberries. 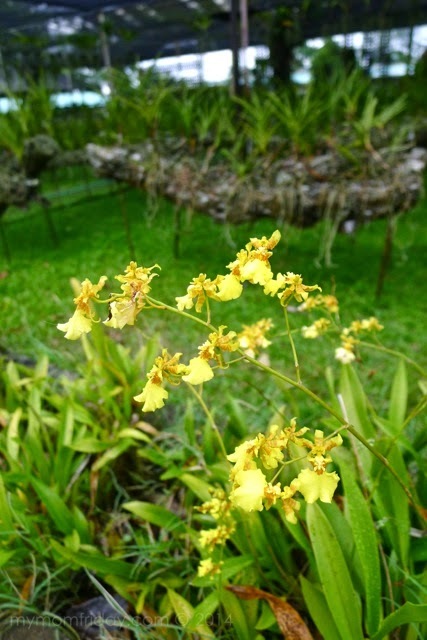 Too bad no orchid blooms except for this row of yellow dancing lady orchids. "Why is it dancing lady, mommy?" Before I could explain, she blurted, "ooh, this is the wavy skirt and this is the head of the lady!" 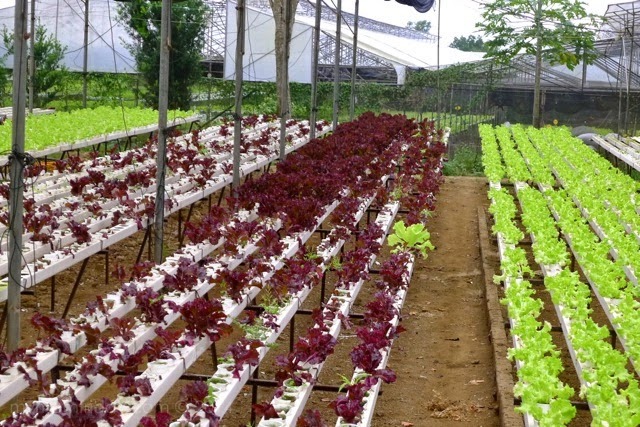 Hydroponic garden as far as the eye can see! They looked like a floating sea of lettuce. 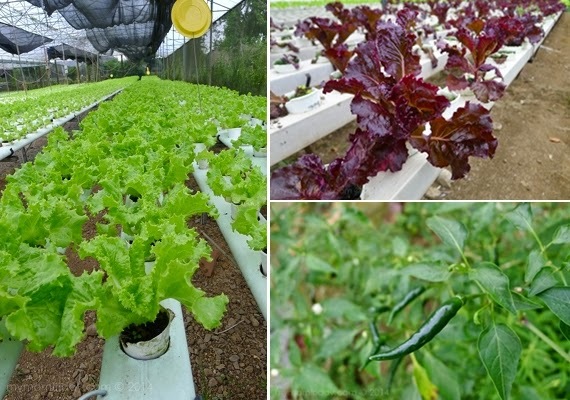 They have varieties like romaine and green ice lettuce. Lot of bird's eye chili too. 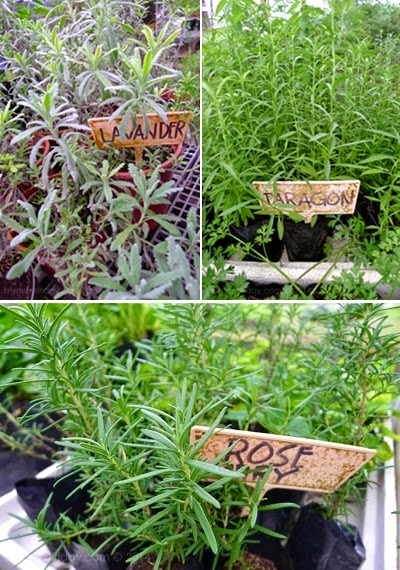 Fragrant lavender, taragon, dill, and rosemary. Yoki's also care for some farm animals, and exotic birds like red and blue macaws, and cockatoo. Of course, the movie RIO came to mind. There were also peacocks and rabbits. 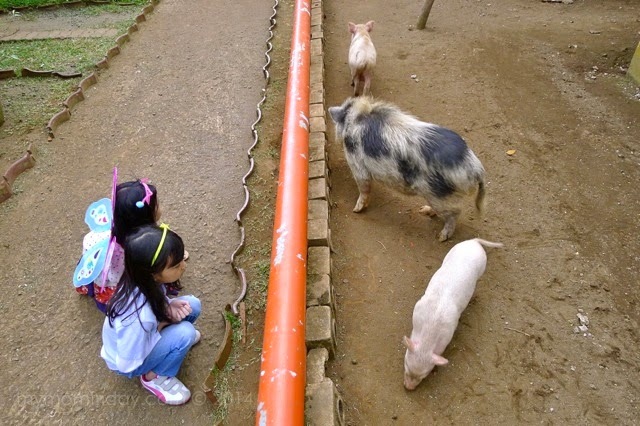 Here, piggie, piggie... Just a fence separating the girls and the pigs. 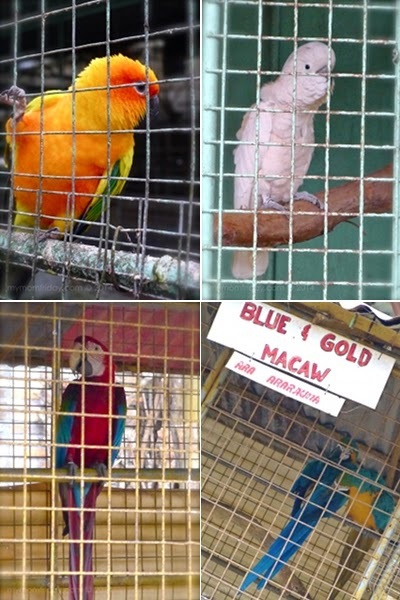 The owners plan to add more animals and improve the facilities as well. Before we left the farm, we had some snacks and refreshments at the owner's quaint farmhouse. 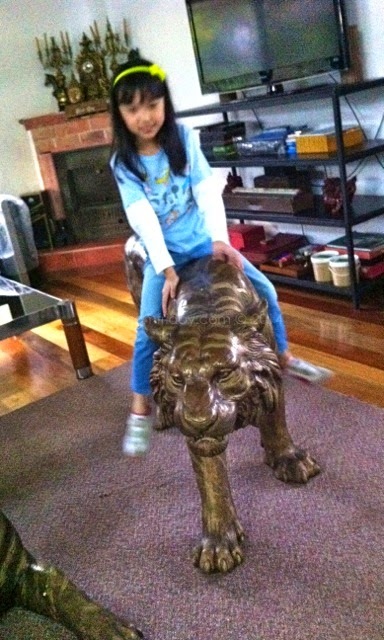 Huling hirit ni bulilit... one last "ride" pa! At first, she didn't want to go to tour the farm and thought it would be boring. When we left, she said she had a great time and was glad she went with me. 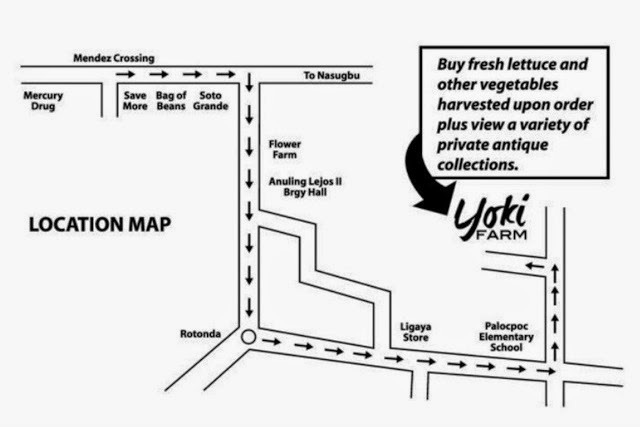 Don't leave without bringing home some fresh veggies from Yoki. 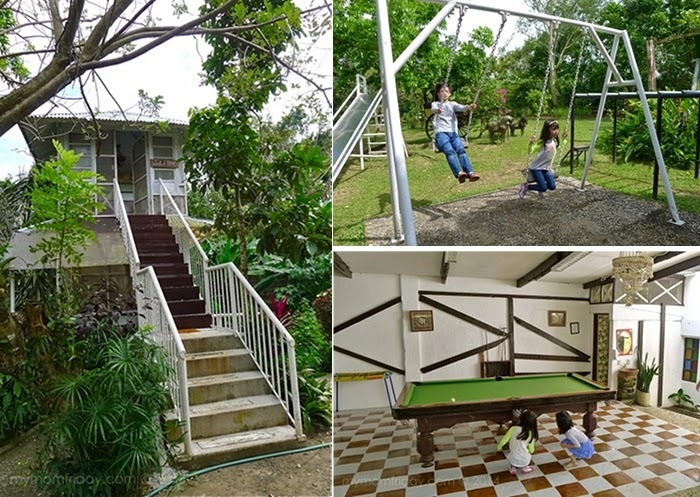 An idyllic bed and breakfast cottage-style house complete with dining hall, lounge and living area, entertainment facilities, swimming pool and pavilion, secret garden, and several cozy rustic rooms. 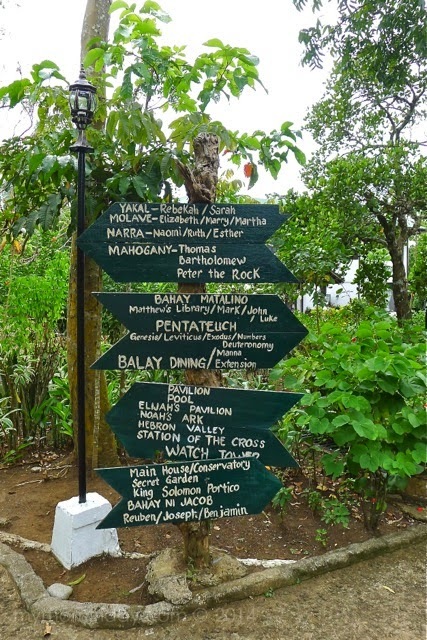 After we checked-out of Wilson's Place on the second day, we were received at Balay Indang for lunch and had a most amazing tour of the sprawling property. 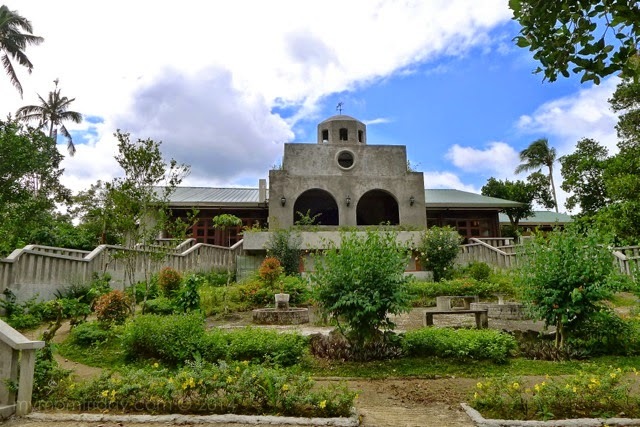 With an inconspicuous facade to Balay Indang's main house, you wouldn't guess it's depth and beauty inside. 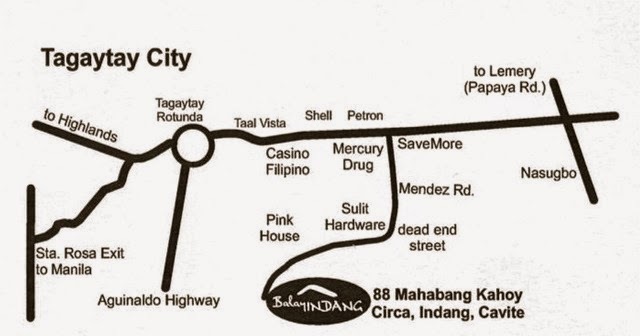 Souvenir and pasalubong shop; directions to the different amenities within the compound. This is the spacious living area and lounge, as viewed from the second floor where the rooms and suites are located. Their theme here is rustic with old world charm. Unfortunately, there were no rooms available for viewing at the time we were there. 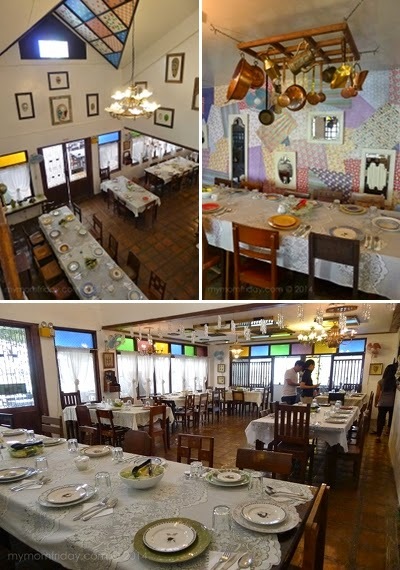 High ceiling with framed mirrors and artwork on the walls at the main dining hall; cozy dining nooks with shabby chic interiors. 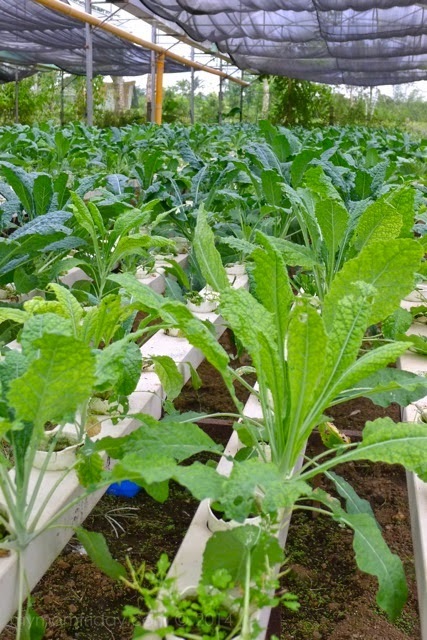 We had the freshest salad -- with harvest greens from Yoki's farm. 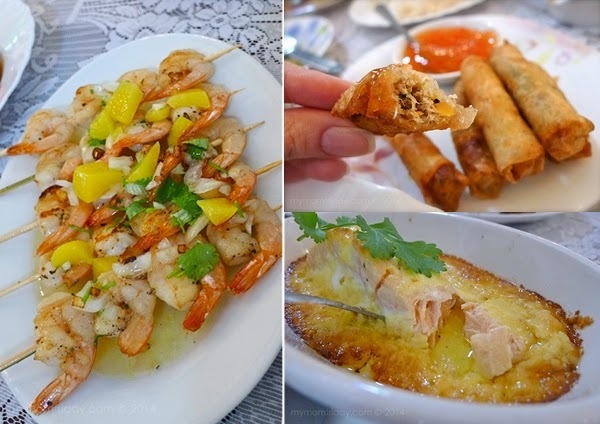 Seafood galore: This succulent and flavorful shrimp kebab with citrus mango salsa is the bomb -- J got a stick and the girl and I finished everything. 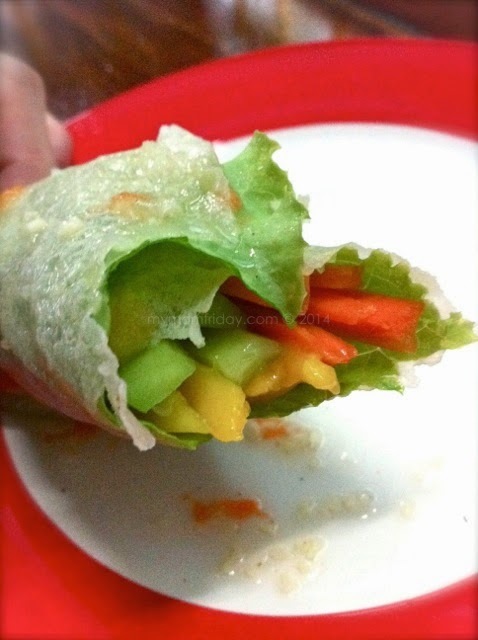 My boy enjoyed this crispy tinapa lumpia (considering he doesn't eat tinapa). I was full when this perfectly baked salmon came out so I just had to have a small piece, as well as the delicious salmon pasta. J devoured this tender barbecue baby back ribs. We were also served kaldereta and tasty gising-gising to complete our lunch. It's outdoor time after our hearty lunch. Imagine this gazebo draped in blooms and vines for a pituresque wedding ceremony. 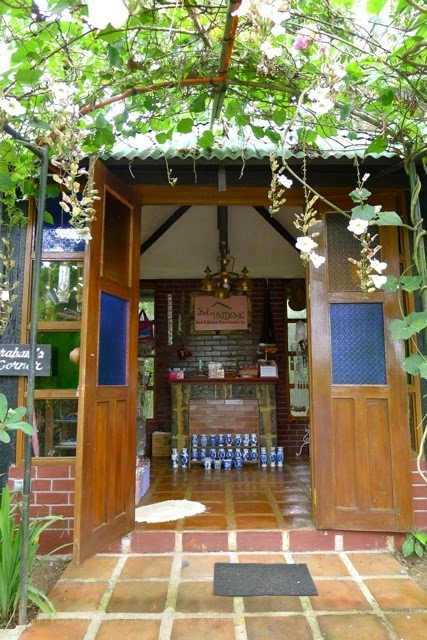 At Balay Indang, you will truly appreciate the simplicity and beauty of provincial life that allow guests to commune with nature with the convenience of modern amenities. It's no wonder they have a growing list of regular visitors, and retreats and weddings are being booked one after another. 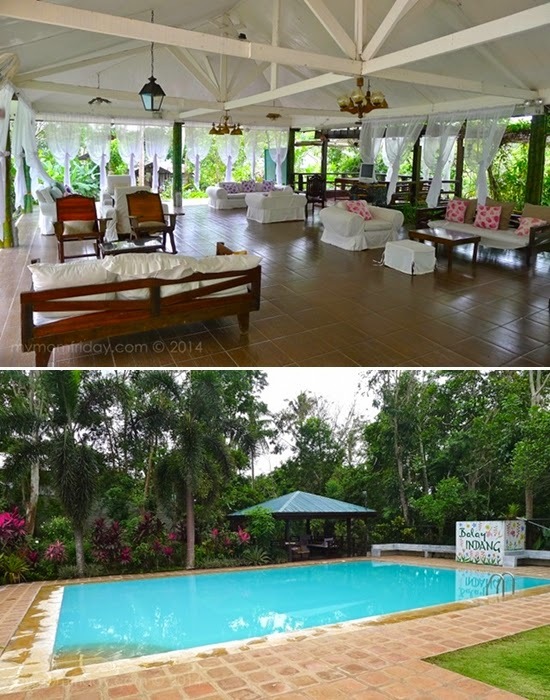 Poolside pavillion where guests can relax, host parties, or have meetings and team building activities. The largest event venue is Elizabeth's Hall, perfect for a banquet. There is also a private room at the back for smaller functions. Outside the hall is this new structure being finished -- also ideal for social events and even wedding ceremonies. The kids will not run out of things to do and explore here. They have a watch tower, pool table, and playground. Fresh air, wide, open fields where kids and run and roam freely. 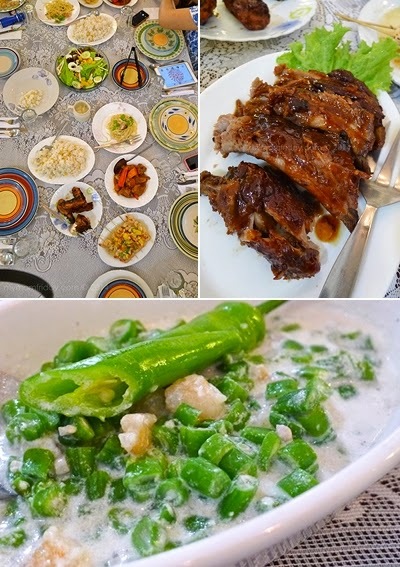 Our day tours were the highlights of our weekend getaway -- a feast to our senses. Another memorable trip to be thankful for. 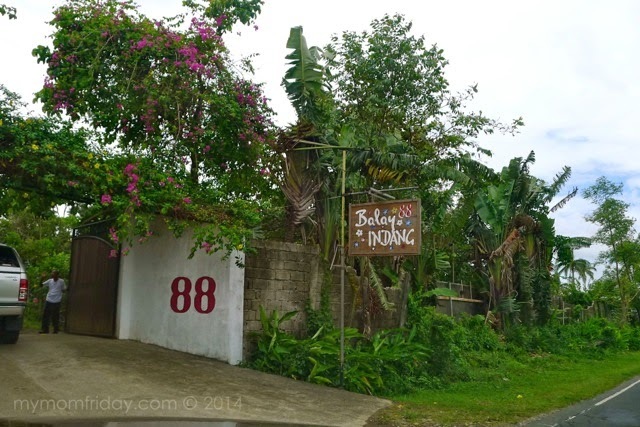 I'm amazed that despite not having any major advertising efforts, Yoki's and Balay Indang continue to draw visitors from around the country. 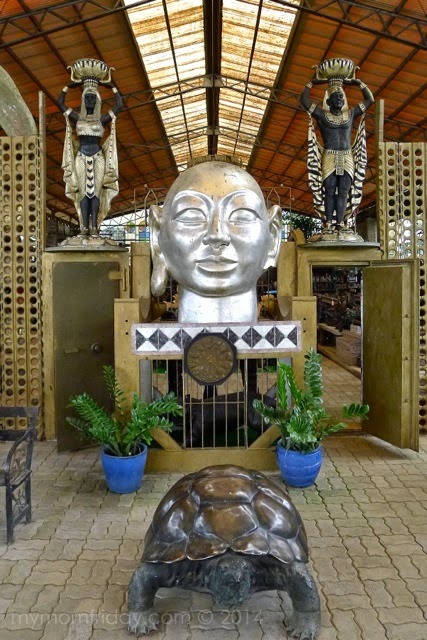 To think that what started as a hobby for the owners, having this provincial estate, it became a place that housed their vast private collection of sculptures, Asian and European art, travel mementos that they now share to the viewing public. 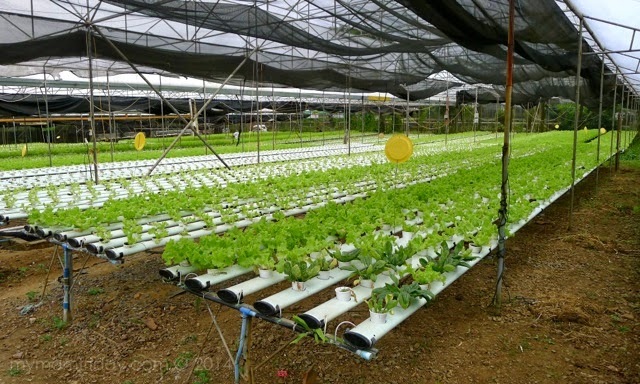 Their expansive farm has ongoing developments as well. 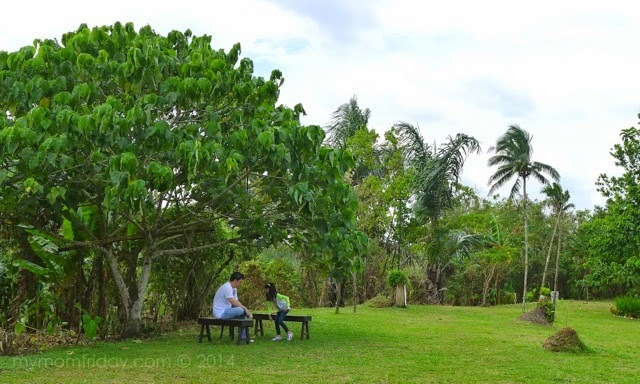 Many soon-to-wed couples hold pre-nuptial pictorials at either venues. 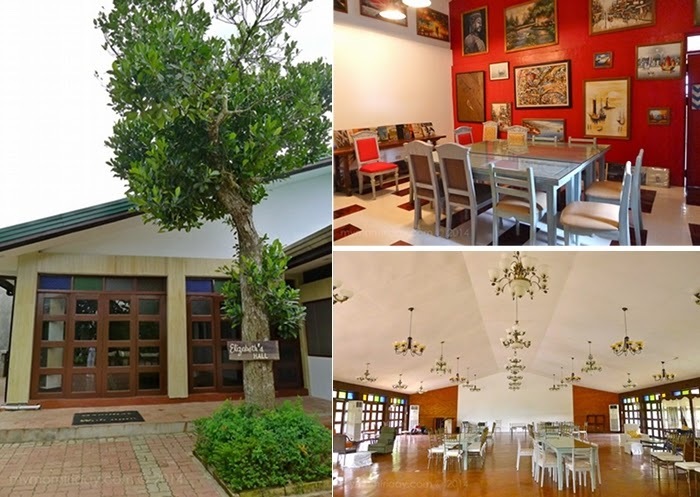 Weekend retreats, corporate and private functions are also accommodated at Balay Indang. Just call them for bookings. Both establishments are considered tourist destinations in their own right. 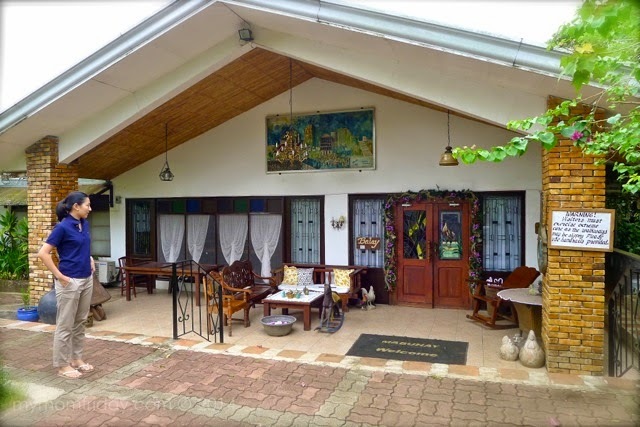 When you're planning to travel in this side of town, consider a tour of Yoki's Farm and Balay Indang for some nature-tripping, gastronomic delights, and experience the diverse attractions that they offer in a rustic provincial setting.